Background information about the Aquarius satellite mission at http://www.nasa.gov/mission_pages/aquarius/news/aquarius20110610.html. When used in the classroom, the video needs adequate scaffolding to focus students on satellites, remote sensing, climate, nature of science, or the topic of choice. Water's salinity and temperature, which together determine seawater density, regulate ocean circulation. Computer models help to predict global temperatures, but ocean salinity is measured in a number of ways. 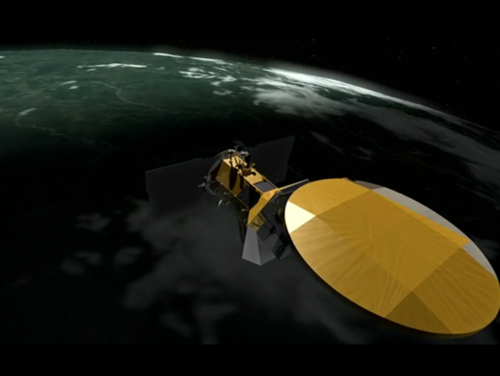 NASA earth-orbit satellites, such as Aquarius, measure a wide variety of variables such as rainfall, surface wind, sea surface temperature (SST), sea level, and even ocean color. Observations like this help unlock the links between the ocean and climate. Comments from expert scientist: This video describes how satellites measure sea surface salinity (SSS) and how the SSS measurements fit into the satellite oceanography constellation. Video describes how the instruments work and what extra measurements need to be taken in order to make the most accurate assessment of SSS. Teacher can reinforce the nature of science principles during the video. The video itself serves as a great visualization to support a discussion of the importance of satellite observations to help develop computer models. The video can also be used to show students how satellites work, how scientists observe the Earth from space (remote sensing), and how the ocean dynamics are measured. The transcript at http://aquarius.nasa.gov/pdfs/aquarius_climate_transcript.pdf can be used by hearing impaired users. Downloadable, high-resolution version is available. This high-resolution video may take longer to load.